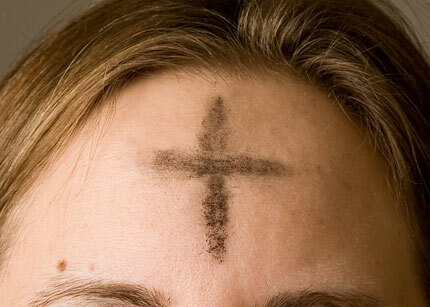 In 2010, I received a request for a "contemporary" Ash Wednesday service. This was a first for this office, to my knowledge. Typically, we've commended using the ritual in the Book of Worship because it does what this service needs to do and because it does so using highly ecumenically recognizable language and symbols and standard United Methodist resources. At the same time, the "feeling" of that service, if done "straight" (i.e., without very careful attention to issues of flow) can be rather choppy, offering far too many opportunities for distraction in a service that should be all about attentive focus. by Jennifer Balaska. Public Domain. So below is one design that does what the existing service does but with music from The Faith We Sing and Worship & Song, fewer spoken words, and greater attention to multiple senses and flow. If you're up for something different this year, give this a try, and let me know by e-mail or the Facebook United Methodist Worship Group how it went, along with any adaptations you made or improvements you might suggest. * Stand as you are able. The worship space should be fairly dark, illuminated only by candles (perhaps several banks of votive candles placed around the worship space) and the light on a projection screen, wall or scrim. Have an usher stationed, along with signs posted, encouraging people to enter in silence. A video of these words is available here. A couple of minutes before the service formally begins, instrumentalists begin to play "O-So-So" (The Faith We Sing, 2232) ) or Dust and Ashes (Worship & Song, 3098) softly. A vocalist hums the tune once or twice before inviting all to sing verse 1, kneeling. Project the words of the song on the screen just before the singing is to begin. Instrumentalists continue playing the song softly while a reader reads. Do NOT project the words of this text. Let the focus be on the reader and on listening to the text. Let the screen keep the background (but not the words) of the opening loop. When the reader finishes, let the instrumentalists finish the verse they are playing, then invite the assembly to sing. Still kneeling; words on the screen. Again, instrumentalists continue playing while a reader reads. The screen returns to the background as before. The reader finishes; the instrumentalists finish the verse; then cue the congregation to stand and sing. While the pastor or deacon or lay leader (if no deacon is present) or lay speaker (if no lay leader is present) brings the gospel to the center of the assembly and reads it . . .
All standing, instruments still playing the song. The assembly sings as the reader of the gospel moves back to the front and the pastor lifts the container holding the ashes. At the words "reconcile your people" in verse 4 of "O-So-So" or "lead us through the desert sands" in "Dust and Ashes," refrain (second time), the pastor blesses the ashes with the sign of the cross. As the song concludes, the pastor gestures in silence for the people to come to receive the ashes. This should be done in a deliberate, unhurried way. Give each person ample time to kneel or bow to receive. Offer one station per 35-50 people, and plan for 10 seconds per person. The action is offered in silence, with the words, "Remember, you are dust" and "Repent, believe the gospel," alternating on the projection screen, scrim, or wall. As the ashes are received, a soloist with soft piano or guitar accompaniment sings. A soloist with ensemble/congregational response (for those in line or having already received), may sing. Instrumental music from this and other appropriate songs focused on repentance, confession and forgiveness (but NOT the cross! Lent is not Holy Week!) may continue until all have received and returned to their places. Then all sing. Musicians begin segue into TFWS 2157 or W&S 3135. Pastor: In Jesus Christ, you are forgiven. People: In Jesus Christ, we all have peace. Ensemble sings "Come and Fill Our Hearts with Your Peace" (TFWS 2157) or "-In God Alone" (W&S 3135) once through, and invites congregation to join as they share Christ's peace with one another, words projected onscreen. In the background of the projection you may wish to project the word "Peace" in other languages -- Peace, Shalom, Eirene, Salaam, Shantih, Ruh, Paix, Paz, and whatever other languages may be spoken in the region where you are. If this service continues with Holy Communion (highly recommended! ), follow the guidance beginning here. If not, skip to the end of this resource (Sending Forth without Communion) for suggestions for concluding the service shortly after the Peace. The people may be standing and invited to join the leader in praying at the "orans" position -- hands raised slightly out to the sides, elbows bent, palms up. Instrumentalists segue to the opening of The Great Thanksgiving (TFWS 2257a). The presider (elder or local pastor) leads The Great Thanksgiving using the musical setting and The Great Thanksgiving for Early in Lent from The United Methodist Book of Worship (60-61). The presider may invite the congregation to continue praying in the orans position. The congregation uses the musical setting TFWS 2257. These words may appear on screen just before the congregation needs to sing them. Instrumental accompaniment (soft chords related to the setting) may continue through the presider's prayer. There is no reason to include the entire prayer onscreen. During the distribution, the congregation and a soloist, using the choir or accompaniment edition, may sing. Once again, plan on at least one station per 35-50 persons served, and do not rush. Other instrumental music relating to Holy Communion may be offered from The Faith We Sing or Worship & Song. As all are served and the table is re-set, instrumentalists should begin segue to TFWS 2241, "The Spirit Sends Us forth to Serve" or "As We Go" (W&S 3183). This plays in the background during the dismissal with blessing. Go in peace, to love and serve God and your neighbor. Instrumentalists should segue smoothly to "Walk with Me" (TFWS 2242) or "As We Part for Towns and Cities" (W&S 3180) during the dismissal and Lord's Prayer that follows. Taylor Burton-Edwards is Director of Worship Resources with Discipleship Ministries.